As a group, we presented the final outcome of the Ice Breaker project. 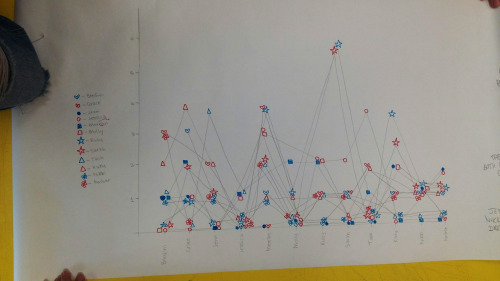 In the end we settled for the idea of presenting our findings as a selection of graphs. This was actually surprisingly successful; it conveyed our message clearly and, despite all being Illustration students, we opted for a graphic display suggesting we weren’t afraid to break out of the sketchy, drawings-based presentation commonly associated with Illustrators. 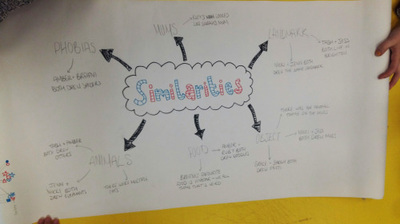 The second graph in particular was the most effective showing links between everyone’s drawings. The process of creating this graph also ‘broke the ice’ more than the task itself! We all had a laugh when trying to guess whose drawing was whose but the complications that came with creating this graph caused us to pull together and in turn form friendships. Each member of the group was delegated a task which, when all combined, produced this confusing, but interesting and insightful graph. We asked questions such as, does the number of correct guesses per person relate to the compatibility of each person in terms of their likelihood for possible friendships (as this task was based on getting to know one and other); we found that two people guessed every single drawing of the other person correctly as these people had already formed a friendship from their past course. 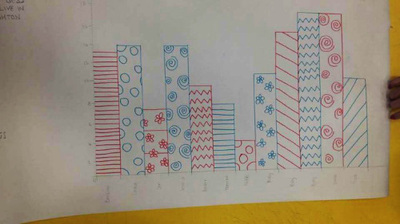 It was also suggested that we repeat the process at the end of the year and compare our results. 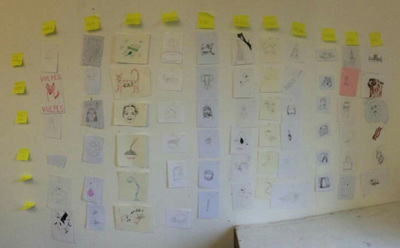 I wonder if we would be able to guess more people’s drawings correctly. I anticipate this would be the case. Overall, this project certainly did ‘break the ice’ even if this was simply learning names of others in the class and becoming familiar in the educational setting. In addition, we did have fun and bonded well as individuals and as a team. Each draw an image from decided categories. Place in a pile and muddle. Guess whose is whose. The problems came when attempting to decide how to record our outcome. The main suggestion made was to record our results on a graph in the form of correct guesses and who was the easiest to guess. A few members of the group, including myself, were not satisfied with this idea. To me, the idea didn’t feel refined, inventive or creative enough though, with no better suggestions, we took on the task.